It is a known fact that we cannot produce an immediate change to current life conditions, as action and time are required to produce such results. 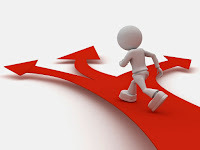 However, we can immediately change the direction we are heading to, by changing our decisions. Thus a New Beginning is conceived each time. Decisions are continuous. We do not always know when we are making them. But with a little practice with the ones we recognize, a set begins to form which sees us through the rest. It is not wise to let yourself to become preoccupied with every step you take. The proper set, adopted consciously each time you make, will put you ahead. This will give you the "edge" to consciously think of what kind of day you would like to have, and tell yourself there is a way in which this very day can happen just like that. Your day is not at random. It is set by what you choose to live it with. Choosing consciously becomes vital to a meaningful life. What does it means to become more conscious? It is the progressive realization of conscious mastery over your mind. The challenge is that it takes consciousness to grow consciousness. But you needn’t worry about this because you already have the seed. Think of it like fire. You have a flame, and you want to turn that flame into a huge blaze. How do you do it? You add fuel. Here are some examples of how you can add fuel to your flame of consciousness. First, accept the truth. Whatever you’re afraid to know lowers your consciousness. 2. Courage - Courage raises your consciousness. Cowardice lowers it. Courage is the gatekeeper between unconscious growth and conscious growth. 3. Compassion - Compassion raises your consciousness. Cruelty lowers it. A great way to become more conscious is to search for signs of unconscious cruelty and disconnection in your life. 4. Desire - Desire raises your consciousness. Apathy lowers it. When you get clear about what you want, such as by setting a goal, you raise your consciousness. 5. Attention - Attention raises your consciousness. Distraction lowers it. 6. Knowledge - Knowledge raises your consciousness. Ignorance lowers it. 7. Reason - Reason raises your consciousness. Irrationality lowers it. 8. Conscious people - Conscious people raise your consciousness. Unconscious people lower it. Seek out others you perceive to be at a higher level of consciousness than you are. Talk to them, ask questions, and enjoy their presence. 10. Intention - The intention to raise your consciousness raises it. The intention to lower your consciousness lowers it. Consciousness has the capacity to self-expand or self-contract, just as you have the capacity to grow or to commit suicide. In any given moment, you have the freedom of choice. "What we have done for ourselves alone dies with us; what we have done for others and the world remains and it is immortal." - Albert Pike.